Given that I owe my livelihood to the English language, I never thought I’d find myself defending someone who apparently thinks the first letter of the alphabet is "8." I'm speaking, of course, about Avril Lavigne. It seems like a week doesn't go by that I don't pick up the newspaper to find somebody slagging off the young pop singer. And, boy, are they ever nasty. Janice Kennedy kicked off the Avril bashing with a Style Weekly column calling Lavigne a "poser" whose "lucrative persona" is clearly "a product of slick manipulation" by "stylists as adept at carving out your image as they are at re-fashioning your music into something smart and saleable." She went on to suggest that "Avril dear" hire a personal tutor to give her a lesson in good manners, then wrapped up the piece by calling her "clueless" and possessed of a "flat-out ignorance [that] is just plain embarrassing." Argument & Observation contributor Eli Schuster doesn't write nearly as well as Ms. Kennedy, but he's no slouch in the nasty department. Schuster calls Lavigne's breakout hit Complicated a "whiny little tune," her follow-up song Sk8er Boi "obnoxious," dismisses the rest of her work as "puerile pap" and suggests that crack cocaine was somehow involved in the writing process. As for the small town of Napanee, it is apparently "in the grip of an embarrassing hysteria of Avrilmania" caused by "half wits" hoping to currying favour with a "barely educated anti-Britney." All this, by the way, from a man who claims to "bear her no ill will." Imagine if he didn't like her? Nobody, it seems, can resist a sly dig. News reports quote the young singer at great length and without missing a single "like," "you know" or "cool." Great hay was made of her "I'm getting more famouser" flub on American TV. An Arts section round-up article about this year's Grammy contenders suggested, apropos of nothing, that Lavigne be awarded "an award for fad instigator of the year." 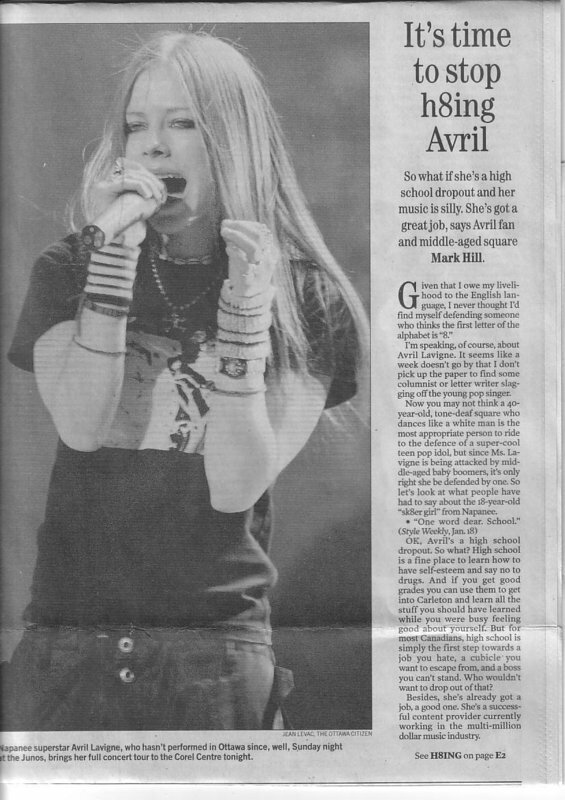 Even the fashion section led off a full-page piece on how to copy Avril's look by asking "is her skater-punk style really her own?" Now you may not think a 40-year-old, tone-deaf square who dances like a white man is the most appropriate person to ride to the defense of a super-cool teen pop idol, but since Ms. Lavigne is being attacked by middle-aged baby boomers, it's only right she be defended by one. So let's look at what people have had to say about the 18-year-old "Sk8er Girl" from Napanee. 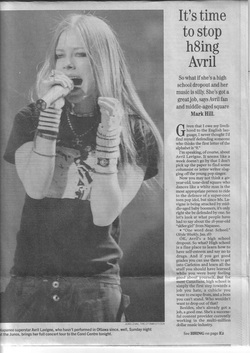 Okay, Avril's a high school dropout. But so what? High school is a fine place to learn how to have self-esteem and say no to drugs. And if you get good grades you can use them to get into Carleton and learn all the stuff you should have learned while you were busy feeling good about yourself. But for most Canadians high school is simply the first step on the road towards a job you hate, a cubicle you want to escape from, and a boss you can't stand. Who wouldn't want to drop out of that? Besides, she's already got a job, a good one. She's a successful content provider currently working in the multi-million dollar music industry. Funny, isn't it, how "young" is a positive thing in the working world — young lawyer, young doctor, etc. Go into business or politics in your early twenties and everybody credits your ambition and drive. But get a top-level job in the entertainment industry while in your late teens and you're some sort of a cop-out. Have you been reading all those news stories about the high number of teenage girls dropping out of school to become pop singers? Me neither. Since Avril Lavigne burst on the scene I've seen hundreds of young girls listening to Avril, dressing like Avril, and doing the hand/finger thing like Avril. I've seen most of these girls on the bus — on their way to and from school. Fact is, young people may see Avril as a role model, but they know the difference between her life and real life. This statement is offensive to all airheads, many of whom are mature individuals holding senior positions of great responsibility in government and business. "He was a sk8er boi, she said see ya later boi." Okay, it's a bit silly. But so was Madonna's "Get into the groove. Boy you've got to prove your love to me." Or Elvis's "Do anything that you wanna do. But uh uh honey lay off of my blue suede shoes." Or even the Beatles' own "I wanna hold your ha … a … a … and." Let's face it, pop lyrics have always been silly. News flash! It's the entertainment business and Avril's not a real skater chick. So what? I'll bet Xena isn't a real warrior princess, either. Good. There's at least one artist who won't be bothering us with a remake of Let's Dance. All-in-all, and compared to other pop stars, Avril has a lot going for her. She may not be a genius or a poster child for corporate Canada, but she's never gone into rehab, she's never toured overseas and passed herself off as an American, she's never lip-synched at the Super Bowl, she's never had her breasts augmented then bragged about it on the radio, she's never been a Spice anything, and she's never changed her name to A Lo. Plus, her hair is always nice and clean. So come on folks, lighten up. Cut poor Avril some slack. She's not running for public office. She's not sitting on the Supreme Court. She's a pop singer. Now waddaya say we give the kid a br8ke. Mark Hill is an Ottawa wryter dewd.